MATA's USPTA Tennis Pro, Chris Choate, will be offerning beginner tennis lessons: June 3-7 and June 10-14 at Chandler Park Tennis Courts. 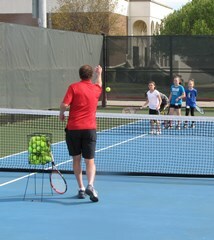 Each day kids will learn the sport of tennis from 9am to 11am. Registration will be through the Mansfield Activity Center by calling 817-728-3680 or online registration. $65 per player per week. MATA will provide tennis equipment. Kids need to wear sports clothes and shoes and bring water. For more information contact Angela at asexton@matatx.com.